Free Printable October 2015 Calendar. 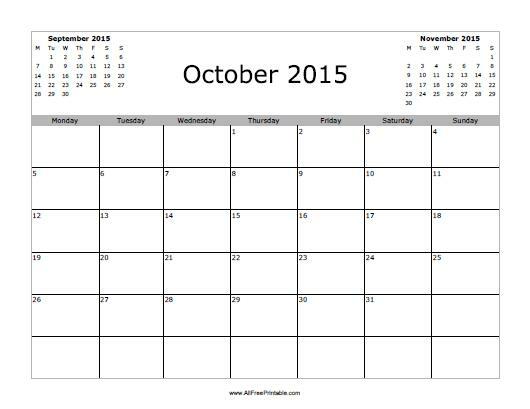 Printable October 2015 Calendar. Free Calendar to write all the things you have to remember at work, school or home. Our free printable calendar includes previous and next month. Select from two free printable options, calendar starting the week on Monday or Sunday. Use our free printable October 2015 calendar to write important tasks of October 2015, school test, Halloween Costume Party, special sale event, business presentations, TV Show, things to do at home and more. Click the link of your choice to download or print now. Instructions: The print link will open a new window in your browser with the PDF file so you can print or download using your browser’s menu.